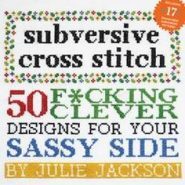 If you’ve never cross stitched before, Julie may inspire you and she offers detailed animated instructions for newbies and many other helpful links including resources for creating your cross stitch designs. 50% of her F*[email protected]# cancer kits go to the Susan G. Komen Breast Cancer Foundation which is a generous gesture and a worthy cause. Nancy G.Brinker started the foundation after promising her dying sister she would do everything in her power to end breast cancer. Julie also supports Crafting for Critters, with proceeds going to numerous animal rescue groups. Some of these groups include PAWS (The Performing Animal Welfare Society, a place where abused, abandoned or retired performing animals and victims can live in peace and contentment), Best Friends Animal Society and Animal Protection and Rescue League. April Hamilton at Bitter Stitching was inspired by Julie and started a similar business, announcing “I sublimate my rage through needlework.” Her designs are more on a misandrist slant, but some of them are still funny, and her prices are reasonable. Julie invites everyone to get in on the fun and strongly encourages people to strike out on their own. She began a Flickr group where individuals can display pictures of their finished products, share craft ideas and inspire each other. If you’re interested in designing your own cross stitch patterns, PCStitch is a fun and easy program to use. It has all kinds of funky fonts to choose from, and you can decide on colors and sizes ahead of time. There is an import feature which allows you to create patterns with photographs, clip art and more. The program can be found on eBay from anywhere from five to twenty dollars. Another subversive embroidery site worthy of mention is Nicole"s Lochers from Paris, selling beautiful, saucy embroidered blouses with dirty sayings stitched onto them.